In Pretoria, Winter is here in every sense of the word. In the morning I struggle to get out of bed because, even though it’s usually a beautiful day outside, there’s an iciness in the air that can only be braved with lots of coffee and a blanket wrapped around oneself. The afternoons are normally really pleasant with just a slight chill in the air before the iciness returns for it’s evening shift. But I’m not complaining…I Love Winter! The only thing I don’t like about Winter is seeing all the trees stripped of their leaves. And with Winter around, the only thing I ever really want is comforting stew. As a child, I despised stew. As an adult, I’m addicted to it. There’s just something about meat cooked for so long that it literally falls apart when you push into it. Slowly sauteed onions, carrots and celery fill your home with the most incredible aromas and when garlic and bay leaf are added, this elevates to another level. There is just so much good about stew! I’ve spoken before about my dad’s ‘thinking’ that he is a bit of an Italian, because he works with Italians. For example, when my brother orders a Four Seasons pizza (Quattro Stagione), my dad says “aaahhh Quattrrrrrro Stag-i-o-ne, this means Four Seasons. Quattrrrrro being Four, Stag-i-o-ne being Seasons”. Yes, thanks dad, I think we got that! Whenever I say I’m making anything Italian, he’ll ‘correct’ my pronunciation and accentuate his “r’s” and give me a lesson…not that he speaks Italian of course. When I told him I made Osso Buco with Gremolata for dinner, he said “what? ooohh, Ossssoo Buccccco with (weeth) Grrremmolaata”, yes dad, that! My brothers and I always laugh about it but it’s one of those things that I wouldn’t change for the world. Even though I get sick of it and it annoys me at times, it’s also so endearing and charming. And I know my dad’s excited about a meal when he goes all Italian on me. The traditional way of making Osso Buco involves no tomatoes and is called “in Bianco” but more modern versions include tomatoes and sofrito (onions, celery & carrots) and this is my favourite way of cooking it. Normally, Osso Buco would be served with Polenta but I had an intense craving for creamy, smashed baby potatoes so I served my luscious Osso Buco with that. But Mashed potato, polenta, even rice would do. And don’t forget to serve it with Gremolata. 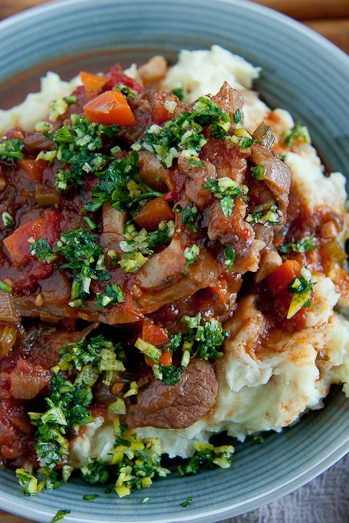 Sprinkled over the top, the gremolata adds a freshness to the stew that just makes it 100x better. In a large oven-proof pot/casserole, fry the meat in a bit of oil until browned all over. Remove and set aside. Fry the onions, carrots and celery for 7-10 minutes until soft, translucent and fragrant. Add the garlic, the bay leaf and the thyme and fry for another minute. Add the chopped tomatoes, sugar, paprika. Stir to combine all the ingredients. Add the meat back to the pot and pour in the beef stock. Stir to coat the meat in the tomato and vegetables and cover the pot. 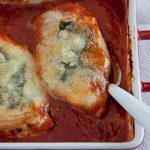 Place in the oven and allow to cook for 2-3 hours until the meat is tender and pulls apart easily. 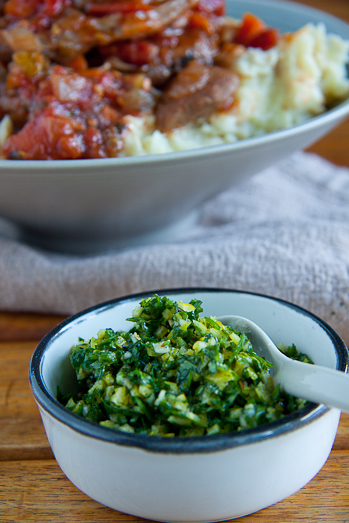 To make the gremolata, combine all the ingredients and set aside until you’re ready to serve. 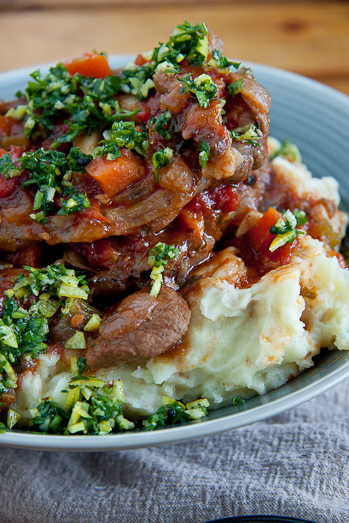 Serve the Osso Buco with starch of your choice and a sprinkling of the gremolata. I don’t actually follow recipes, being an avid epicurian and professiobally qualified chef, but I made a rough resemblance to yours. 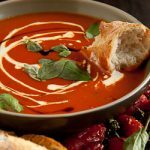 Among other ingredients, I added oregano and 250ml of red wine to the broth, and an Italian friend of mine complemented that it was the closest to the version she was accustomed to at home in Tuscany. So good to know that fellow ‘Gautengers’ also appreciate Mediterranean cuisine! I made this last night and it was awesome. I made it with 1kg shin and 1 kg oxtail. I also added 200 ml red wine. The gremolata is a must! (I was sceptical at first…) Thanks for sharing. Thanks for all the great recipes. Nigella is also one of my favourite peronalities. Just one question. How do you manage to make all this nice food with twins at home? I’m struggeling to get time just for coffee with my 4 month old baby. This is such a cliche, but those pics are truly mouthwatering Alida! Osso Buco was delecious… I added wine to recipe! Was a stunner!! i absolutely love ur blog!! stumbled upon it, while looking for a bread recipe. Im officially a fan! Ek is mal hieroor, veral saam met Gremolata! 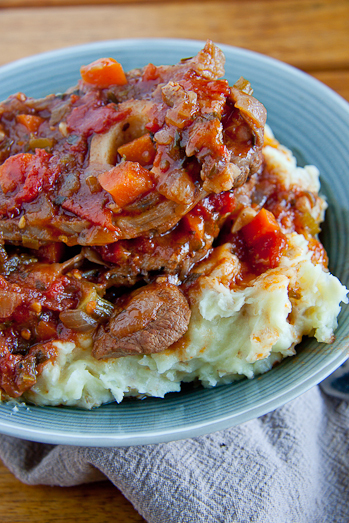 How can you have a recipe for Osso Buco that doesn’t include wine? de Waal : I would’ve added wine to my Osso Bucco but my husband doesn’t like the taste of wine in food and I don’t like adding wine to the food my kids eat. If you would like to add wine, just add 200ml White wine after sweating off the vegetables to deglaze the pot.